One thing I love about doing recipe swaps is that I often end up with recipes I wouldn’t have picked out on my own. I’ve had homemade pasta on my to-make list for a while, but I’ve been treating it as something of a pipe dream – something I’d get to on some lazy Saturday when we’re snowed in and I happened to have all the ingredients on hand. Instead of getting the perfect storm, I got a recipe that involved homemade pasta for this round of the recipe swap – vegetarian recipes. I’ll fully admit I was nervous about this – not only was it way out of my comfort zone, it was something I’d have to pull off on a weeknight after work because of our schedule. Eeek! All of my worrying was for naught, though – these were incredibly easy, even for a weeknight. It took a few tries to get the noodles the right thickness, but once I got the hang of it the process moved along quickly. If you have “make homemade pasta” on your cooking bucket list, this is a great recipe to start with! Whisk flour, milk, 3 eggs, and salt in a bowl until smooth. Pour about 2-3 tablespoons into a hot greased frying pan and spread to a 5 inch circle or smaller. Cook over medium heat until set-do not brown. The top will be slightly doughy. Repeat with remaining batter, making about 18 crepes. Stack crepes between wax paper and set aside. Pour half of the sauce into an ungreased baking dish and set aside. Saute the spinach with a dash of salt in an ungreased saute pan until wilted, stirring occasionally, about 8 minutes. Remove from heat. For the filling, combine the cheeses, egg, parsley, and spinach. Spoon about 3-4 tablespoons into each crepe. Roll or fold up and place the crepes over the sauce. Pour remaining sauce over the top. Cover and bake for 20 minutes. Uncover and bake for an additional 20 minutes. Sprinkle with additional parmesan cheese and serve. 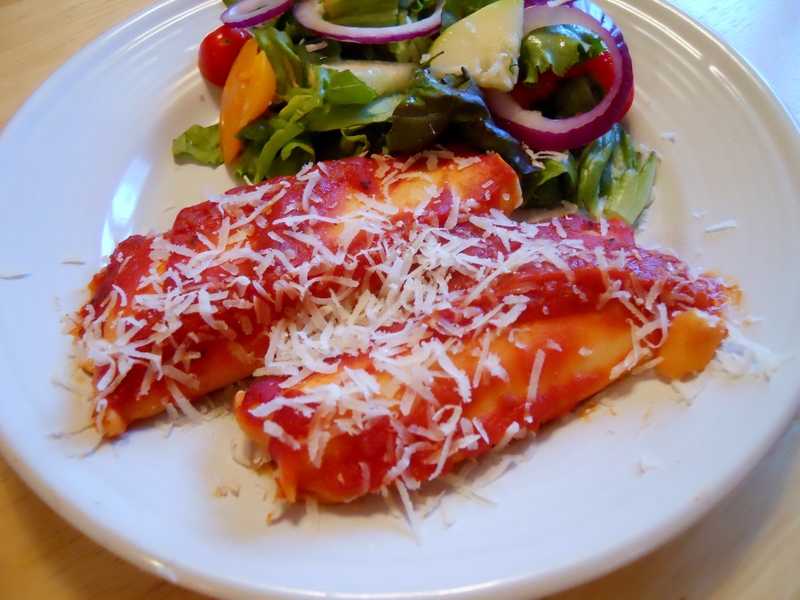 Manicotti are one of those dishes that remind me of being a kid. Manicotti isn’t one of those thing that I’ve thought of making the pasta for. I’ll have to tackle this when we get our pasta maker this fall. So glad you were up for the challenge! I would have been nervous too but it sounds like they were easy to make. Thanks for being part of the recipe swaps!